When life coach Barbie Paget was told by her doctor that she was “too fat to hold (herself up)” after breaking her ankle earlier in her life, she made a decision to learn about what she was putting into her body. In the third module of her success workshop, Paget emphasized that “we never want to diet” and what healthy habits people should build to control their eating. The impact of utilizing steady breathing to engage the body’s “rest and digest” processes from her first module came back as a point in her third. “What’s really fascinating is that when you look at the parasympathetic nervous system, digestion is calm,” Paget said. She pointed to a study wherein a control group was given mineral water under two conditions, calm and stressed, and that the results found that less nutrients were taken in during the stressed conditions. “If you eat in a stressed out state, you may become hungry sooner, because you aren’t absorbing the nutrients in that food,” she said. Paget emphasized “mindful eating” as the better alternative to popular dieting strategies. She said to ask oneself “Does this align to who I want to be as an eater?” before people go after the food in front of them. Paget also gave advice on what to do if there’s food within arm’s reach that the eater is unsure about. She also noted that if you do want that cookie or slice of pizza, to go ahead and to just be conscious of the decision. Calories and sugar intake were both topics that she tackled, to help her audience understand the effects of what they were dealing with daily. According to Paget, skipping breakfast is fine as long as people don’t snack or take calories in until their first actual meal, since calories are what start up the digestive system. She also said that sugar impacts short term memory and results in a crash, so taking in something like candy or soda before a test would be a bad decision. She couldn’t emphasize the importance of mindset heavily enough beyond that. ARC student Desiree Castillo considered that being mindful was the most important thing she took away from the module. Emeralda Tidera, who was handling sign-ins for the workshop, was surprised to learn about sugar intake; whereas an intake of 20 grams a day is generally recommended, people will end up at a 140 or more on a regular day, according to Paget. “Yeah. … the sugar, the amount of grams that we really eat, compared to what we’re supposed to be eating,” Tidera said. 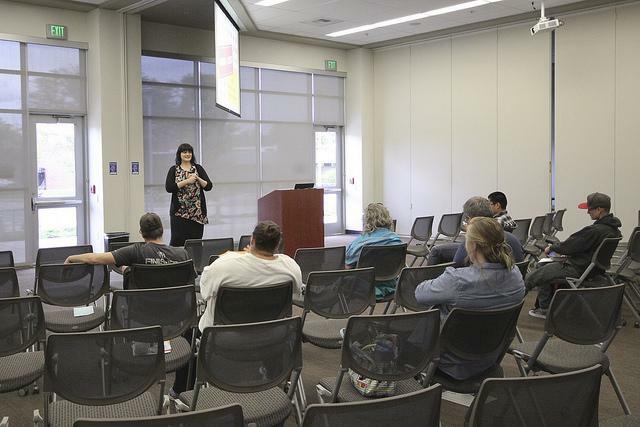 Be the first to comment on "Life coach gives nutrition advice at ARC"